The unrest in the Middle East has spread to Libya, where Col. Muammar Gaddafi’s 41-year reign may be ending — or not. People apparently are protesting, and the government may have hired mercenaries and sent planes to mow down the demonstrators. It’s hard to say, because there are no reporters in Libya, and a lot of the “reporting” seems to be sifting through “tweets” and “re-tweets” and dealing with unconfirmed rumor. We can fairly conclude that something is happening, because Gaddafi’s kid gave a bizarre, finger-wagging, fight-to-the-last-bullet speech. You wouldn’t expect that kind of diatribe unless circumstances were dire — although trying to assess the conduct of the Gaddafis by applying the standards of normal, rational behavior is probably doomed to failure. From the speech, it sounds like Gaddafi Junior is a chip off the old block in the weirdness department. 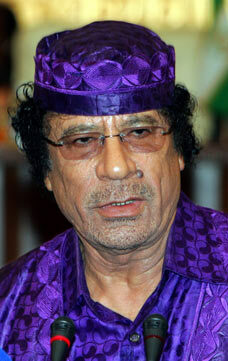 At any given time, Muammar Gaddafi would easily rank in the top 5 in a “strangest leaders of the world” contest. Right now, his chief rivals in that competition probably would be Kim Jong Il, Mahmoud Ahmadinejad, Robert Mugabe, and Hugo Chavez. Gaddafi is a pretty strong candidate for top honors, however. He is known for his rambling speeches, his incomprehensible political philosophy, and for wearing sunglasses, colorful outfits, and curious hats. If he was somebody you knew in college, you would conclude that he is a complete stoner. Instead, he has been the leader of Libya, and in control of its oil riches, for more than 40 years. The world would be a better place if the oppressed people of Libya sent Mo packing — and his kid, too.